The house has been designed to take full advantage of its beachfront location. It features beautifully crafted joinery and cabinetry, luxurious bathrooms and modern classic furniture. A state of the art, fully equipped, travertine kitchen, heated polished concrete floors and fully ducted reverse cycle air-conditioning ensures a high level of comfort. * Four bedrooms and study. Upstairs: two queen-sized bedrooms, one bedroom with bunks. * Downstairs: king bedroom with magnificent views, luxurious ensuite and walk-in robe. * Two bathrooms, plus a powder room, superior linen, towelling and Aveda toiletries. * Magnificent views of Victor Harbour, the Bluff and the ocean beyond. * Open plan living, dining and study with magnificent views. * State of the art travertine kitchen and separate laundry with all modern amenities. * Underfloor heating, fully ducted reverse cycle air conditioning and ceiling fans. * Undercover, lock up garage parking for two cars. 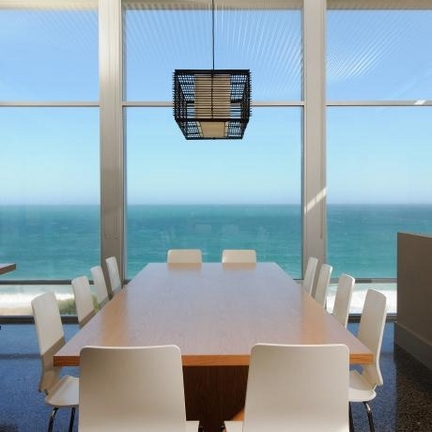 * Port Elliot Beach House allows for a maximum of 8 guests only. Port Elliot Beach House is positioned on the beach front at Port Elliot, directly above Boomer Beach, arguably the best surf beach in South Australia. The property is located 10 minutes walk from quaint local shops and a 15 minute drive from Victor Harbour supermarket complex. Port Elliot is a one hour drive from the centre of Adelaide. Detailed directions will be provided at the time of booking.